Water is the only material that will plasticize the outer layers of the skin, thus giving the feeling of smooth soft skin. If water is lost from your skin it becomes dehydrated. There are many ways your skin can loose its normal water content. The simple addition of water to the skin does not reverse the process, and could make it subsequently worse. An oily material placed over the outside layer blocks water escaping. However, besides blocking pores, it appears to increase the rate of diffusion of water, hence once the coating is breached, water loss is actually faster than prior to application. If sweat occurs, it will wash the barrier away, and dehydration will actually occur faster. 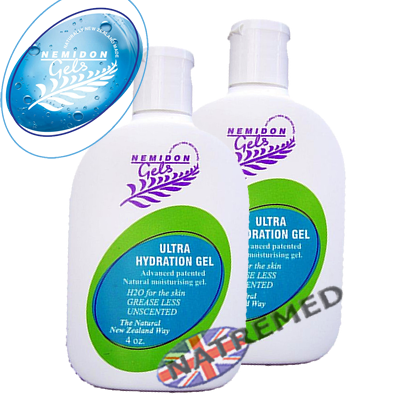 Nemidon Ultra hydration Gel has a unique means of overcoming the dehydration problem. 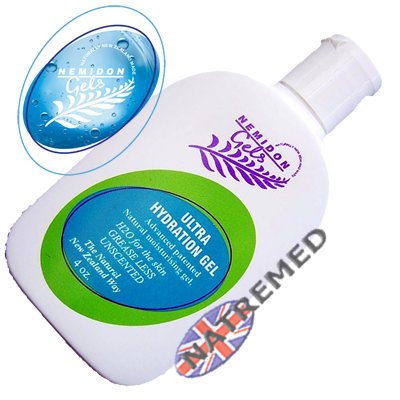 The Ultra Hydration Gel uses seaweed polysaccharide which, when it dries, forms an invisible film over the skin. As the film dries, it appears to shrink, thus forming a tighter film making contact with only the highest parts of the skin. This moisturizer is almost unique in that the pores remain essentially unaffected by the moisturizer. Double blind studies show that Ultra Hydration Gel has the ability to deposit large amounts of water onto the skin with a long lasting effect. Rapid hydration, long lasting protection. Clear unscented gel, None-greasy: It is a pure aqueous gel, Does not stain clothing. Contains no petrochemicals or alcohol. After application no residue is left. Acts as a moisture regulator, Water or sweat is able to pass in and out ie the skin can breathe. 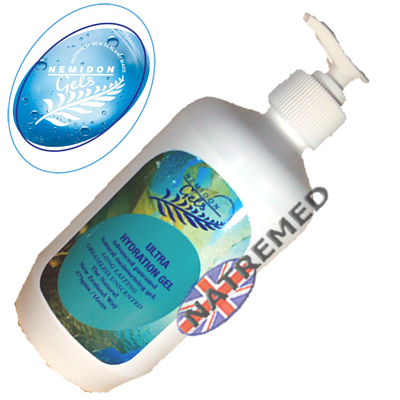 Upon application the product will inherently pass water rapidly from the gel to the skin. If the skin is dry this will occur rapidly until the skin`s integrity improves. This depends upon the texture of the skin which may take from 3 - 10 days to improve.